Developed from the latest technology, SAF-T-LOK® Threadlocker Grade adhesives are designed to provide performance characteristics that others only talk about. SAF-T-LOK has been the primary supplier of threadlockers to the space program and the US Military as well as leading edge industries. 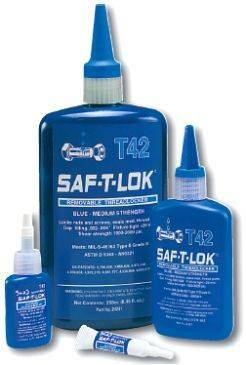 SAF-T-LOK® Anaerobic Adhesives/Sealants reliably lock and seal metal assemblies in a wide range of applications. Anaerobic threadlockers cure to a tough resilient plastic shim in the absence of air and presence of metal. By safely holding components they eliminate loosening and costly breakdowns and damage to equipment from vibration and shock, thus providing a SAF-T factor in engineering design. Available with certificates of conformance, SAF-T-LOK® Threadlocker Grade Adhesives are provided in a broad range of strengths and viscosities meeting Military Specification MIL-S-22473 and MIL-S-46163 as well as ASTM D5363. 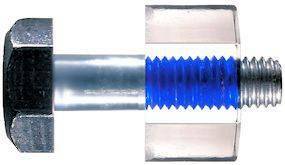 Thread Locker adhesives can be applied manually from the ergonomically designed bottles or through automatic dispensing systems. Locks studs over 1/2" dia.